Do you hear that? It’s the sound of your Bluetooth® speaker playing the song you requested. We brought this feature to life after hearing how much you wanted to amp up the sound with your Google Home Mini. To get started, pair any compatible Bluetooth speaker with your Google Home: Open the Google Home app, head to device settings and follow the pairing instructions to make it your default speaker. Then give it a whirl. Say “Hey Google, shuffle my workout playlist” or “Hey Google, turn up the volume.” The music will automatically play on your Bluetooth speaker—without you having to tell Google the name of the device. These features work across the entire Home family. 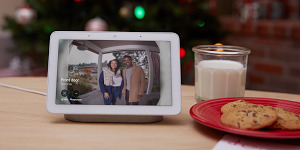 Note you'll still need to talk to your Google Home device—not the connected Bluetooth speaker—for queries like asking questions, getting weather updates and using smart home commands. Together, Google Home and Bluetooth speakers make the perfect arrangement for amping up the music throughout your entire home. We’ve edited this post to clarify that Bluetooth speaker output is fully compatible with the existing speaker groups functionality in the Google Home app, but it does not directly enable multi-room audio.